Winter has arrived, and for many of us, that means snow and ice on the roads. Are you ready for winter driving? Follow these tips to help you get to your destination and back home safely. Plan your travel and route. Check the weather and road conditions, and plan to leave early if necessary. Even if you use your car’s GPS, familiarize yourself with directions and maps before you leave the house. And to prevent unnecessary worry, let others know your route and when you plan to arrive. Remove ice and snow before driving. Have you seen people (or have you been one of them) who scrape just enough ice off the windows to see? “Peephole driving” reduces your field of vision, so take the time to scrape and defrost your windows. And while you’re at it, thoroughly brush the snow from your vehicle so it doesn’t fly off and startle other drivers, which could cause an accident. Fill your windshield washer reservoir. Use high-quality, no-freeze fluid, and keep an extra jug in your vehicle in case you run out. Check your battery’s charge. Temperature and battery power go hand in hand: When one drops, so does the other. Check or have your mechanic check your battery for sufficient voltage; have the charging system, belts and cable connections inspected; and replace the battery if necessary. Fill your gas tank. If you get stuck in a traffic jam or in snow, you might need more fuel to get home or keep warm. If you do happen to get stuck in snow, stay with your car. Put bright markers on the windows or antenna so you’re easily visible. To avoid carbon monoxide poisoning, keep your exhaust pipe clear of snow, run your vehicle with your windows partially down and run it only long enough to keep warm. Carry emergency supplies. Being prepared for winter driving means having these emergency supplies at the ready: an ice scraper; a snow shovel and broom; sand or kitty litter for behind-wheel traction; jumper cables; warning devices and markers; a flashlight; blankets; a charger for your cellphone; and water and food. Identify your braking system. The last thing you want is to have your brakes lock up and lose the ability to steer. To prevent a lockup, apply firm, continuous pressure if you have anti-lock brakes; pump the pedal gently if you have standard brakes. Avoid using cruise control. While cruise control improves gas mileage, it’s dangerous to use when road conditions are less than ideal. The purpose of cruise control is to keep your tires moving at a consistent speed, and that’s not smart in dicey conditions because you can lose control of your vehicle. Instead, drive for the road conditions, remain alert and keep enough space between you and the vehicle in front of you. If possible, stay home. If you don’t need to go out, by all means, stay home! 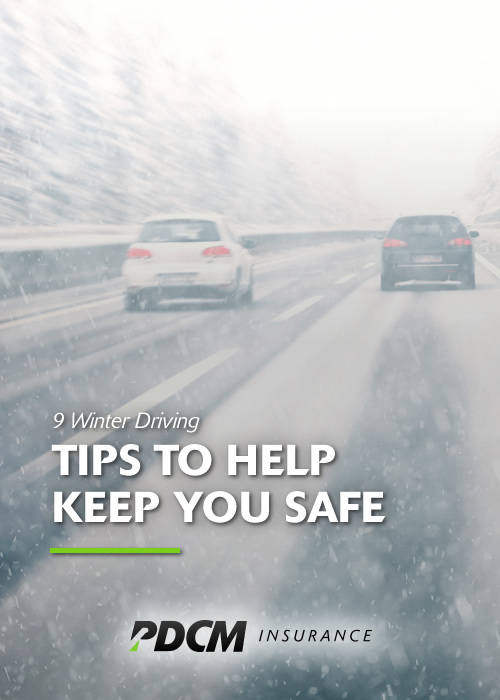 Do you have winter driving tips to share with your fellow drivers? Let us know! January 28, 2016 in Insurance News.